Lip Gloss from the '80s. When I was about 12, I babysat my cousins every Thursday night while my aunt attended a ceramics class at the local high school. The only reason I can recall these babysitting sessions taking place on Thursday nights is because of NBC's Must See TV line up. I remember starting the evening off watching Cosby Show and Family Ties with four well-behaved little cousins. I'd send them to bed around 9 and tune into Cheers and Night Court. I knew it was getting super late when Hill Street Blues came on. I'm guessing my aunt would grab a coffee with a friend on those late Hill Street Blues nights. My aunt was a stay-at-home mom with four small children. She wasn't exactly made of money and her life wasn't exactly easy or filled with lavish vacations and purchases. My parents wouldn't allow me to accept any form of cash payment. This was okay by me -- I felt funny taking money from family anyway. My aunt had a friend who sold Avon. To thank me for giving up my Thursday nights, she'd gift me fun little treats from Avon. I especially remember loving this Hershey's Chocolate Kiss Lip Gloss from Avon. I wish I could get my hands on that exact same Avon lip gloss today without spending $30 on eBay. It smelled so chocolaty and delicious. 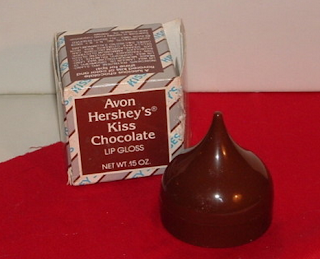 The Hershey's Chocolate Kiss Lip Gloss came in a plastic kiss-shaped and tasted so yummy on my lips. It's funny, we get so many expensive gifts throughout our lives, yet I never forgot receiving that small token gift. Do you remember a simple gift that stuck with you throughout the years? Loving your blog. :) I just found it and am having a blast! I never saw that, but I'm sure if I had as a kid I'd never have stopped opening it and sniffing it. I don't know how it's possible, but I never saw this one before. It's probably a good thing; I might've tried eating it.